Morpheme Remedies Arthcare Pain Relief Oil is a wonderful product for people suffering from body aches and joint pain. It is formulated using natural ingredients such as Withania somnifera, garlic, ajwain, peppermint, and other Indian herbs to help in maintaining proper joint functions. This oil has a unique property of penetrating deep into the dermal cells on massaging and soothing the underlying pain in the muscles and joints. Regular use of this oil for weeks could help in improving the overall functioning of the muscles and joints. This product is completely natural and safe for long-term use. 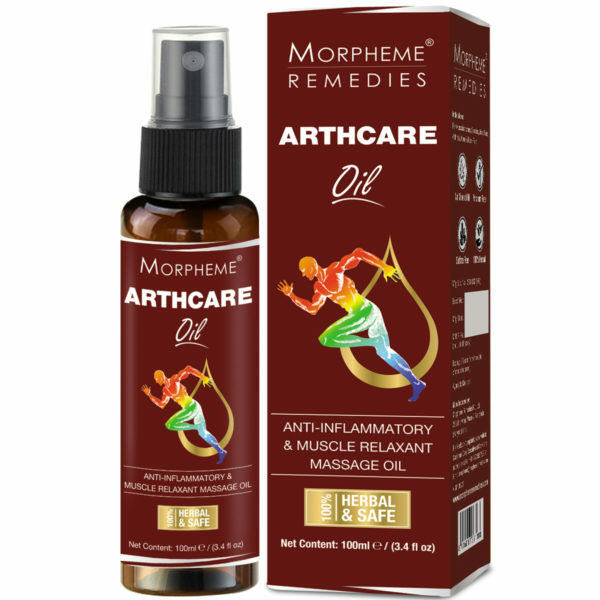 Morpheme Remedies Arthcare Oil is a 100% natural oil with indigenous herbs . Arthcare pain relief oil is a popular massage oil used for managing knee, leg, joints and body pain. Pains are caused due to inflammatory responses in the musculoskeletal system leading to a loss in joint functions, joint pain, muscle aches, and joint stiffness. The natural extracts in the oil are rich in anti-inflammatory properties which play a key role in improving blood circulation and joint movements in the body. Massaging the affected area with the oil for a few minutes helps relieve the pain. 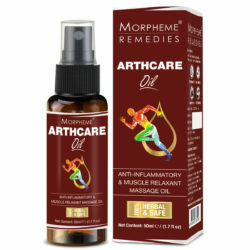 Arthcare pain relief oil is a perfect massage oil for body aches. 100% made from natural ingredients. 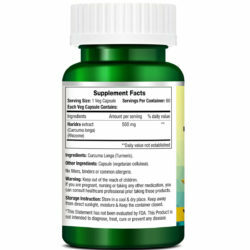 Has strong biochemical extracts of several indigenous anti-inflammatory herbs. Useful to improve blood circulation and proper function of the muscles and joints. Massaging the oil on the affected parts gives instant relief from the pain. Can be used for leg, knee, back and body pains. 1. Does the oil burn during or after application? No, the oil does not burn. But apply only on the external skin surfaces and not on any wounds or broken areas. 2. Can this be applied for hip pain? This oil is specifically used for reducing muscle and joint pains. Try using on the hips gently and if you find any improvement in the affected area, you can proceed with it. 3. Is the oil child-friendly? Yes, the oil can be used for children above 8 years. Use the oil only under adult supervision and keep it out of their reach. Avoid applying the oil on the facial areas such as forehead, eyes, nose, chin, and cheeks. 4. Can I use the oil for body massage? Yes, use only a few drops of the oil for massaging your body. For effective results, go for a massage during severe muscle and joint aches. 5. Does the oil relieve sore muscles and knee pain due to sports regimen? This is an amazing massage oil. Purchased it for my mom who was suffering from osteoarthritis of the knee for quite sometime. It has helped in reducing the pain and stiffness. A good herbal oil for reducing arthritis symptoms. Massaging my knees with the oil twice daily has significantly helped in improving the function of the joints. I love the cooling effect of arthcare oil when I apply it to the aching muscles and joints. Though I bought it for my mother who is an osteoarthritis patient, but later realized that It helps with all types of muscle and joint pain. This is indeed a great oil for joint pain. My mother who is suffering from knee pain for several years has found this oil most effective compared to the other oils she used before. 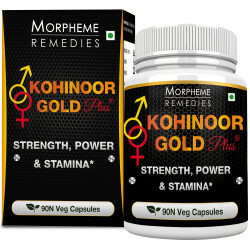 It helps in reducing joint and muscle pain. Its cooling effect helps in reducing the sensation of pain in a short time. Excellent pain relief oil. My ankle was hurting me for quite some time. Arthcare Oil helped in reducing the pain. Used it for my leg muscle pain. It helped in reducing the pain. This massage oil works quite fast in reducing pain. I found this oil very effective for joint pain. My mother is an osteoarthritis patient. Twice a day she massages her affected joints with the oil. It has helped immensely in controlling the pain and inflammation. Found this herbal oil helpful in reducing my joint pain. It helps in providing fast relief from joint and muscle pain. 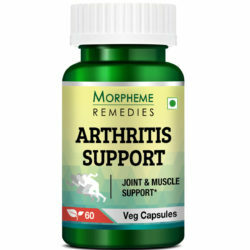 For arthritis, it works best when applied daily. This is good massage oil for aching joints and muscles. So far it has worked for me. This massage oil helps in relieving joint pain. I purchased it for my mom and she was satisfied with the result. There was some improvement in knee pain. It has helped reduce my lower back pain. Arthcare oil works fast. It cools the swollen joint and helps reduce the pain. It is helping in strengthening the knee joints. For my recurrent joint pain, I am using Arthcare Oil. It helped in decreasing the pain and swelling. It works fast. I’m using Arthcare Oil for the last 6 months. It has been of great help to me. My knee pain is less and the joints have strengthened. Excellent massage oil. Soothes the painful areas and helps in relieving pain fast. With regular use this oil helps in controlling arthritis pain. My mother, who is suffering from osteoarthritis of the knee for several years, is using this oil for the last 3 months. Good massage oil for the painful knees. It quickly soothes the area. Arthcare oil helps in reducing joint pain. It absorbs fast and helps provide relief fast. Good massage oil. Helps in reducing muscle and joint pain. It works for me. I apply arthcare oil daily to my knees. It is helping in reducing the pain and stiffness in the knee joints. This oil helped in reducing my lower back pain. It soothes the area when I apply it. This oil has helped in reducing my knee pain. It is a good pain relief oil and works fast. A persistent ankle pain was bothering me for some time. Luckily, I found this product. It helped in reducing the pain. I bought this massage oil for my mother. She’s using it for a month. Her knee pain is now less. This oil has helped in strengthening the joints. My father is using this oil for the last 2 months. It helped reduce his knee pain and strengthened the joints. This is a good oil for pain relief. It soothes the sore muscles and provides quick relief. I am using this oil for my knee pain. The soothing effect of the oil helps in providing quick relief. With regular use, there has been improvement. Arthcare oil has helped relieve my lower back pain. It soothes the area and works fast. I’m using this oil for 2 weeks for lower back pain. It helped in reducing the pain. 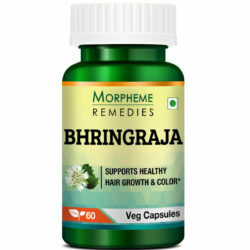 It soothes the painful area and helps in providing faster relief. This herbal oil helps soothe the sore muscle. I use this for muscle and joint aches. It gave me good result. I am suffering from arthritis. I use this oil daily to massage my aching joints. It helps in maintaining the healthy functioning of the joints. This oil has been effective in reducing joint and muscle pain. I bought it for my lower back pain. It soothes the area and helped reduce the pain. Now my entire family is using it for muscle aches and joint pain. This oil helps soothe my sore muscles and joints. Good massage oil. This oil is helping in relieving my knee pain. It shows result in a short time. It soothes and cools the painful area. This oil helps in relieving joint pain. I am suffering from osteoarthritis for several years. This oil is helping in improving the health of my joints. This oil helps relieve joint pain. It soothes the sore muscles. The oil helps reduce my joint pain. It produces result in a short time. This is a good massage oil. 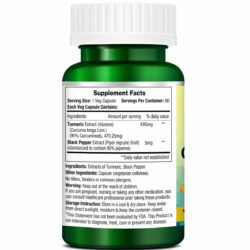 It helped reduce muscle and joint pain. Arthcare oil helped reduce my lower back pain. It quickly soothes the sore muscles and provides fast relief. This oil is quite effective in reducing joint and muscle pain. I used it for a nagging ankle pain. It helped reduce the pain and its effect lasts for a long time. This is an effective pain relief oil. It helped reduce the persistent knee pain I was suffering for a few months. It helped reduce joint pain. Using it for a month. This oil helps in reducing joint and muscle pain. It works for me. It helped relieve my lower back pain. I use this oil daily. This is helping in managing arthritis pain. My mother applies this oil daily to her knees affected by osteoarthritis. It helps reduce pain and maintain joint mobility. This is good oil for reducing joint and muscle ache. It absorbs quickly and soothes the affected area. Helps strengthen the joints. This oil is really good for managing arthritis pain. I bought this for my mother. She uses it daily. This is helping in reducing pain and maintaining the joint health. It helped reduce knee pain. Started noticing effect in a short time. I found this to be a useful product for knee pain. It helps calm the pain and improves joint movement. I’m using this oil for a month. I am very satisfied with the result. It helps soothe pain and strengthened my knees. This oil is good for arthritis pain management. I am suffering from osteoarthritis. This oil helps strengthen the joints and maintains mobility. Both my parents are suffering from arthritis. They are using this oil for a month. It helped reduce the pain. Using this for knee pain. It helps reduce the pain.It soothes the sore muscles and seems to help strengthen the joints. Very good massage oil. 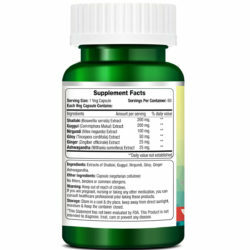 It helps minimize joint and muscle pain and maintains healthy joints. This is a really good oil for pain management. Its soothing effect helps provide faster relief. An effective oil for relieving pain. I use it often to reduce joint or muscle aches and pain. It works fast. Regular use helps strengthen the troubled areas. This oil helps reduce pain. Works fast. Good massage oil. Helps sooth the sore muscles and joints. Good for pain relief. Works well for muscle sprains. 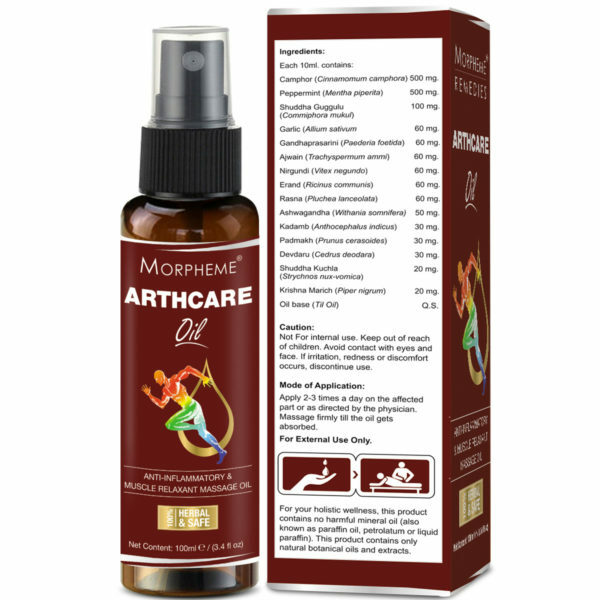 Arthcare oil provides faster relief from joint and muscle pain. I works for me. This helped reduce my knee pain. With regular use it is helping in strengthening the joints. This oil is good for reducing arthritis pain. It has worked for me so far. Using this oil for a week. It helped reduce the inflammation and improved movement of my knees affected by arthritis. Will continue using this wonderful oil for better result. Used this oil for two weeks for ankle pain. It helped reduce the pain and inflammation. Applying the oil soothes the affected area that helps relieve pain. Helps reduce joint pain. Showed result in a short time. This is a good massage oil. Provides relief from aches and pain. So far it has worked for me. This oil is effective. My mom is using it for arthritis pain and it gives her relief. I bought this oil for my knee pain. It helped in reducing the pain. 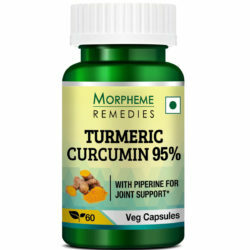 Now I use it for almost every joint and muscle pain and it helps in most cases. This oil is good for the aching joints. Works fast. This oil gives fast relief from joint and muscle pain. I’m suffering from arthritis for a few years. I am using this oil for the last 3 months. This product is working for me. This oil helps in reducing joint and muscle pain. I’m using this for a few weeks. This massage oil helps provide fast relief from joint and muscle pain. I found this effective for managing arthritis pain. It is quite effective in reducing joint pain. I’m using this for a few weeks. This oil soothes the sore muscles and helps provide fast relief. Good for managing acute and chronic pain. 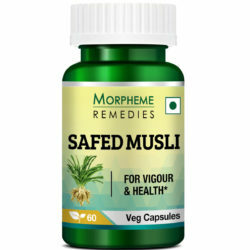 This herbal oil is quite effective in relieving joint and massage aches. I use it frequently. This oil helps in relieving pain. Using it daily helped in improving joint mobility. Directions: Apply few drops of the oil on the affected part repeatedly and massage the muscles and joints well. Use the oil regularly for three to four weeks to see improved results. Do not use the oil on the broken or injured skin.